The American Samoa Community College (ASCC) Fine Arts Department is sponsoring a series of upcoming events to celebrate the creative mediums of filmmaking and Jazz. First, ASCC will be the venue for “Deep Waters – A Pacific Film Showcase” on Tuesday, October 13th and Thursday, October 15th. 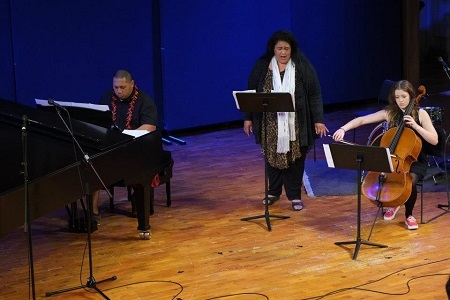 The following week, October 19th-23rd, the College will hold daily Jazz-themed events as part of its Jazz Festival Week 2015, organized to coincide with this year’s Samoana Jazz & Arts Festival. A collaboration between the ASCC Fine Arts Department and Pacific Islanders in Communications (PIC), “Deep Waters – A Pacific Film Showcase” will take place from 12:30 p.m. to 1:30 p.m. in the ASCC Lecture Hall on Tuesday and Thursday, October 13th and 15th. Tuesday’s main feature will be “Taualuga,” a documentary which explores the cultural importance and significance of the Samoan taualuga and the Tongan tau’olunga dances. Also scheduled for screening on Tuesday will be “O a’u o le taupou,” a short film made in American Samoa during a PIC Filmmakers Workshop several years ago. The following week, October 19th to 23rd, the Fine Arts Department will shift its focus to Jazz, one of only two of America’s recognized original contributions to the world’s arts (the other is the skyscraper). On Monday, October 19th, instructor Mr. Poe Mageo will give a Jazz Lecture and Demonstration at noon in the Lecture Hall. The ASCC Jazz Ensemble, led by Mr. Mageo, will perform its Jazz Outdoor Gig on Tuesday at 12:30 p.m. in the ASCC Amphitheater, followed by its Indoor Jazz Gig on Wednesday at noon in the Lecture Hall. On Thursday, one of the Samoana Jazz and Arts Festival headliners from New Zealand, the Opeloge Ah Sam Quintet, will give a performance at 12:30 p.m. in the Amphitheater, to be followed by the visiting artists holding a workshop for ASCC music students. On Friday, October 23rd, the College will host a day-long Samoa Ethnomusicology Forum, “The Sounds of Samoana,” beginning at 8 a.m. in the Lecture Hall. The main presenter will be Dr. Richard Moyle, who has spent several decades researching and documenting music in all of Samoa. 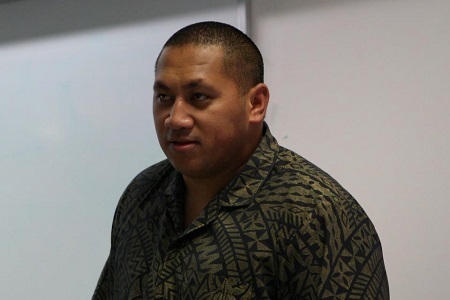 Dr. Moyle will be joined by fellow academics from ASCC and neighboring Samoa, who will present papers focusing on various aspects of music in these islands. For more information on either “Deep Waters – A Pacific Film Showcase” or Jazz Festival Week at ASCC, contact Mr. Tuiasosopo at 699-9155 extension 329. Those interested in learning more about the Opeloge Ah Sam Quintet can visit the website www.opelogeahsam.com. Mr. Ah Sam and his Quintet also have a number of videos posted on YouTube.